For an overall CBSE English exam preparation, attempting and solving English commutative previous year question papers to get good understanding of the questions asked in CBSE (Central Board of Secondary Education) class 10. Download CBSE previous year question papers class 10 English. Practice CBSE English commutative class X exam question papers as test papers. We have shared the previous year papers of English test solved question papers. You can take these CBSE English commutative paper as a test and can practice them on your own. Solving this paper will help you understand the actual level of the CBSE exam and also familiarise with the pattern and syllabus of question asked form different topics. So, download the free solved PDF’s of the English language and English literature class 10 previous year papers form the link provided below now and boost your exam preparation. All the question papers are solved, and comprehensive answers have been provided for each problem for all the sections (Reading, Writing and Grammar, Literature) for class 10 students and teachers. When it comes to getting good marks in English commutative, I’m sure you’ve heard enough from your school teachers and parents for one lifetime of your class 10. If you’re looking for some practical strategies that you can use on your exam preparation today, then you’ll love this CBSE previous year question papers for class 10 English commutative. It’s a simple checklist that will bring in more marks & confident form each last year’s question paper you solve. CBSE English question paper with the solution is the practice of optimizing individual weakness in order to get no surprises on the final day of CBSE board examination. The Board examination is of 80 marks, with a duration of three hours. Why should I Download the CBSE English Commutative Previous Year Question Paper? 1. Feel the real exam through our test papers, this question Paper Includes everything that you are expected to face in CBSE Final Board Exam Class 10. 3. Leave no surprises for the test day - get yourself acquainted with Exam interface on our collection of last year question papers of English Commutative. What types of questions are asked in English Communicative Class 10 CBSE Board? After downloading the previous year English question paper for class 10, you can easily see the type of question asked in previous examination. But in short , The English communicative paper in divided into 3 parts for total of 11 question Section A (Reading), Section B (Writing and Grammar) and Section C (Literature). So in Reading section of 20 Marks – there will be 2 Read the passage question one of 8 marks and another of 12 marks. In Writing and Grammar section 30 Marks- Letter, Article, Write a story, Write the missing words, Rearrange into meaningful sentences etc. And in Literature section of 30 Marks - Textbook and long reading Text. NCERT textbooks for English; Oswaal School Books and S’Chand Publications English Grammar by Davin Martyn are enough for the literature section. You could also refer to previous year question papers and others sample papers during the prep time so, that you prepared in the most functional manner for your English final board Exam class 10. How should I start my preparation for CBSE Class 10 English Commutative Board Exam? You should know the English class X exam pattern, marking scheme. Moreover, you should be aware of the complete NCERT English syllabus & nature of class 10 question papers before you start preparing or the CBSE class 10 Board exams. You should give equal importance to each & every section such as Reading, Writing and Grammar, Literature and try to work on the topics which are frequently asked. Practice makes a man perfect. It is very important to solve Online Solved English question papers and sample Test papers available on our website. It will give you confidence when you will appear in the actual exam. 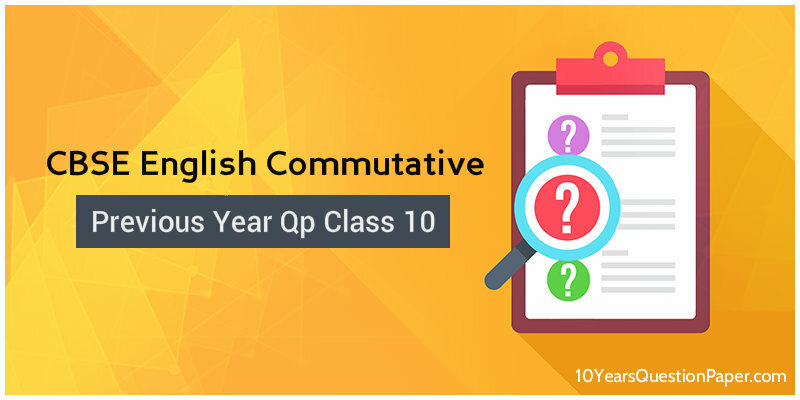 Hence, 10 Years Question Paper Gives you have a thorough practice of the type of questions that were actually asked in this exam and this English communicative based CBSE 10 Board previous year question paper will help you achieve just that. Good luck! This case study is about Amit Agarwal that went from No man’s land in his preparation of English before he stepped into the practicing of English previous year question paper and got 10 CGPA in his CBSE result. In this case study, I’ll highlight two of his main problems and describe two solutions that finally helped him to regain his growth for preparation. He was not happy with his pre-board results so, he contact us we give him some tips (Resource available in YouTube) and asked him to attempt at least 5 previous year question papers completely with time constraints. Which section to do first – A reading, B writing and grammar and C literature? A. Reading section (20 Marks) first because it is unpredictable and lengthy. Tip 1: Read the question before reading the passage. So that you know what all question has been asked by the Examiner and so you read the related lines in passage carefully. Tip 2: Pick at least 10 reading comprehension from question paper provided above. So that your speed and understanding can increase in reading section. B. Writing and grammar Section (30 marks) all the question will be application based so; all grammatical rules should be on your tips. Tip 1: Revise formats (Notice, story writing, formal letters and informal letters and message writing) at least thrice before appearing for exam. So that you get full marks in format. Tip 2: Always keep in mind the word limit in writing (and in all the section) that will also save your time, energy and marks. As marks are deducted if you cross the word limits. C. Literature section (30 Marks) if you are aiming to get 90+ and above in class 10. You need to read all the chapters and attempt the question first that you know. Final tip: Presentation of your answer sheet should be good, underline the main keyword in your answer and try to avoid grammatical error and spelling mastics. English communicative cannot be studied in a day, practicing it through reading, writing listening, and speaking is the best way to gain mastery over the language. Aim to enjoy & your aim of scoring will come true automatically go and learn. CBSE previous year question papers class 10 English, English last year question paper, solved question paper of English class X, CBSE class 10 sample question paper, solved question paper for English, practice question paper for English language and English literature question paper. CBSE English previous year question paper with solution class 10.